Happy Ada Lovelace Day, friends! As many of you will know, Ada Lovelace Day is “an international celebration of the achievements of women in science, technology, engineering and maths (STEM)”. The day is named after the “Enchantress of Numbers”: Augusta Ada King, Countess of Lovelace, who wrote the first algorithm intended to be carried out by a machine — in other words, the first bit of computer programming. 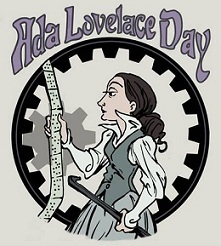 I read Sydney Padua’s The Thrilling Adventures of Lovelace and Babbage towards the end of the summer, but I couldn’t resist posting about it on Ada Lovelace Day. Sadly my blogging time has been scarce of late, which means this will be more of a “this exists and you should read it!” post than an actual detailed review, but no matter: this book does exists and you should most definitely read it. Allow me to attempt to tell you why. 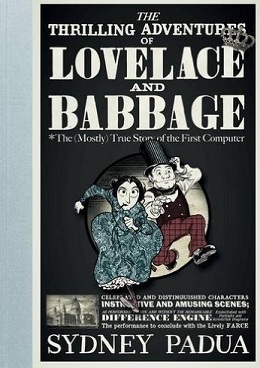 The Thrilling Adventures of Lovelace and Babbage is based on Padua’s webcomic of the same title. It starts out by telling the story of Ada Lovelace’s relationship with mathematician and inventor Charles Babbage, and of their theoretical work on the Analytical Engine, in a more or less straightforward way. But after that, it moves on to something different: as Padua explains, in reality the Analytical Engine was never built — but wouldn’t it be fun to imagine an alternative reality where Lovelace and Babbage developed a complex machine called the Difference Engine, and where the two then went on thrilling crime-solving adventures together and met other renowned Victorians along the way? This is what Padua does for the rest of the comic, and the result couldn’t be more of a delight. 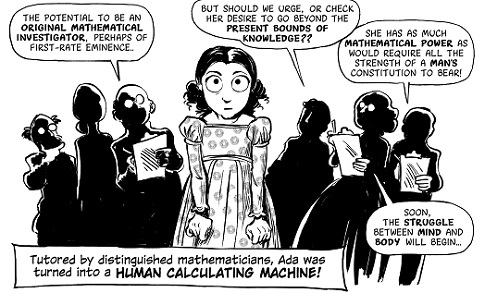 I’ll confess that I’m pretty much the exact target audience for this comic: I love the history of science; I especially love stories about women in STEM; I love the Victorians; I’ve always been interested in Ada Lovelace; I love comics; and, as it turns out, I love Padua’s particular brand of humour. However, I rather suspect that The Thrilling Adventures of Lovelace and Babbage would have won me over even if I didn’t love all of these things. Padua’s voice, revealed in the comic’s extensive footnotes, is a sheer delight, and her clear affection for her subjects and for the history she’s writing about makes the book come alive. Babbage and Lovelace were often paired in period anecdotes, some of which you can find in the appendix. They had similar personalities — egocentric, naïve, enthusiastic, and obsessive — and never quite fit in with stuffy Victorian society. So they were bound to either kill each other or become each other’s biggest fans. Some may wonder — was there anything romantic between them? There’s a good reason to think that there was, and that reason is, it’s extremely funny to think about. Sadly that’s the only reason, as there isn’t a hint of romance in any of their correspondence with each other, and they weren’t exactly the subtlest people in the world. Of course, there was that time Babbage wrote to her that he would visit her and her husband and ponder “that horrible problem—the three bodies”, but even I think that’s a stretch. Babbage did not have the smallest hesitation at yelling at important figures in the British government—he once spent half an hour ranting at Prime Minister Robert Peel. From his own account of the meeting, he began by suggesting other scientists were jealous of him, declared that he had been treated unjustly by the government that had given him huge no-strings sums of cash, and in short did everything but shout, “They laughed at me in the university, but you’ll see—YOU’LL ALL SEE!” and then burst into maniacal laughter. This meeting failed to secure funding for the Analytical Engine. Also, The Thrilling Adventures of Lovelace and Babbage is full of far-fetched adventures, absurd scenarios, and encounters with historical figures (I particularly loved the bit where Lovelace and Babbage meet George Eliot), but I loved that the “what if” scenarios were based on reality. Padua mainly uses primary sources for the dialogue between Lovelace and Babbage, and the stories, though they’re speculative and fanciful, reveal a lot about their lives. 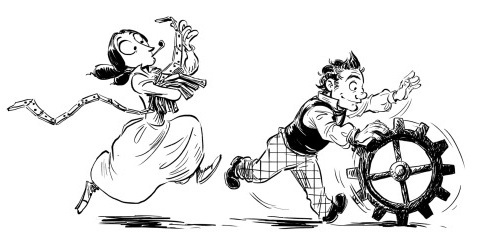 I finished The Thrilling Adventures of Lovelace and Babbage with a real feel for the person Lovelace might have been, and I appreciate how Padua combines that with a light touch and an enormous sense of fun. In conclusion: this book exists! Read it, friends! If you like Kate Beaton’s Hark! A Vagrant and just generally books that affectionately poke fun at history, this is one is definitely for you. They read it too: Booklust, A Library Mama, you? "Oh look, we're present for the invention of the geek!" Haha Love that even the footnotes are fun! Just went and put a hold on this at the library...which makes me very, very happy!!! This sounds so incredibly fun and wonderful that I think it's one that I'm going to have to eventually buy, isn't it? You certainly make this sound delightful - it might even delight a comics neophyte like me! "The length of the footnotes might be offputting" -- oh you beautiful tropical fish. Footnotes are glorious, GLORIOUS. The more I hear about the footnotes, the more joyously certain I am that I will adore this book. "Oh look, we're present for the invention of the geek"..haha that does sound like something from Hark! 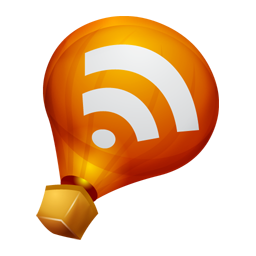 A vagrant :DWill have to look out for this one. Happy Ada Lovelace Day ! And I agree with Jenny that you are a beautiful tropical fish! Oh my, into the wish-list if goes. I think I'll aim at reading it for next year's ADA! Isn't this a fun book? I read a while ago and really loved it. Padua is hilarious and I loved all the footnotes.